When pink Depression glass hit the market in the early 1930s, a bevy of names described the color: Cheri-Glo, Flamingo, Rose Glow, Rose Tint, and Wild Rose, to name a few. Obtained through premiums in cereal boxes, purchased in dime stores, and given away as prizes in movie theaters, the colorful glass brightened the lives of homemakers who were facing harsh economic times. Even today, this glass with a sunset-pink hue attracts many fans. Tea Room, Princess, Royal Lace -- just a few the many intriguing pattern names available in pink. But when it comes to patterns most often sought in pink today, a number of other favorites stand out including Miss America, Mayfair, American Sweetheart, Sharon, and Adam. In each of these patterns, a piece or two is exceedingly difficult to locate. “Take the Sierra-Adam butter dish. That’s why the contemporary philosophy of mixing patterns works. If you can’t afford a really rare piece to complete your set, find an easy substitute and enjoy it,” said Kent Washburn, former president of the National Depression Glass Association. The Sierra-Adam butter dish falls into the category of Holy Grail for many Adam collectors. It combines the popular Adam design with the pinwheel style of the Sierra pattern, both produced by Jeanette Glass Company. Most educated glass dealers price this piece at more than $500 these days, but the traditional Adam butter dish can be found in the $45-95 range. Miss America, with its raised diamond pattern, and Mayfair’s open rose design were both manufactured by Hocking Glass Company. From traditional place settings including dinner plates and cup and saucer sets to elaborate vases and covered candy dishes, both Mayfair and Miss America give shoppers a plethora of pretty choices. Prices in these patterns range from $25-50 per dinner plate to $75-150 for a covered candy dish. But if you think that’s pricey, try finding a pink Mayfair three-legged console bowl or a Miss America divided relish dish. Both those rare pieces can run into the thousands when they can be located. American Sweetheart, made by MacBeth-Evans Glass Company, offers a more delicate shade of pink when compared with other Depression glass patterns. The number of different pieces found in American Sweetheart is more limited, but place settings and all the essential serving pieces were made in this pattern to provide a more than adequate dinner service. While most collectors would like to have a pitcher or salt and pepper pair in pink to complete American Sweetheart sets, they aren’t willing to make the monetary sacrifice. Pitchers in two sizes can easily bring $350-750 apiece, and the salt and pepper sets sell for similar prices when they can be located. Federal Glass Company’s Sharon pattern, also referred to it as Cabbage Rose from time to time, is a more affordable choice. While it has a chunkier look to it when compared with the delicate nature of Mayfair or American Sweetheart, it is generally priced reasonably while offering the appeal of pink in a complete set. When shopping online auctions, dinner plates can be found for $10-15 each. But Sharon shoppers should prepare to pay $125-200 for a matching pitcher and $45-75 for covered sugar and creamer set in this pattern. While a number of patterns, Cherry Blossom and Madrid being the most conspicuous, have been heavily reproduced in pink, other patterns have only one or two items that have been reissued making it less painstaking to keep track of what to avoid. Take Adam as an example. The butter dish is the only piece that has been reproduced in this pattern. Once you learn to distinguish an old Adam butter dish from a new one, then it’s easier to shop without apprehension. Unfortunately, however, reproductions in Mayfair, Miss America and Sharon are more plentiful and some of them are harder to distinguish from older pieces. Although variations in color and a slick feel to the glass are factors that can help differentiate the real deal from reissues, recognizing these characteristics takes some practice. Getting to know which pieces in your pattern have been reproduced does provide some protection for the smart collector though. The differences in new from old often include variations in size, distinctive mold lines and subtle disparities in patterns. Very few old pieces of Depression glass will look brand new on the base, so a lack of wear can be a telltale sign of authenticity as well. Look for a list of known reproduction Depression glass on JustGlass.com. When it comes to finding pink Depression glass at bargain prices, more plentiful pieces and less popular patterns offer the most promise. “More common items like cups and saucers, bread and butter plates, and sherbet dishes can be found more reasonably priced,” said Washburn. “You can put together a lovely dessert set fairly reasonably when compared with department store prices” for similar items. Many times “no-name” Depression glass patterns can be found for a song as well. Plain creamer and sugar sets in pink with a simple wheel cut etching, for example, can be readily located for $10-15 per set. The same set in one of the big five patterns can cost three to five times as much. You can also find these no-name items in online auction listings, along with patterns that haven’t been properly identified by the seller, going for far less than you might expect. 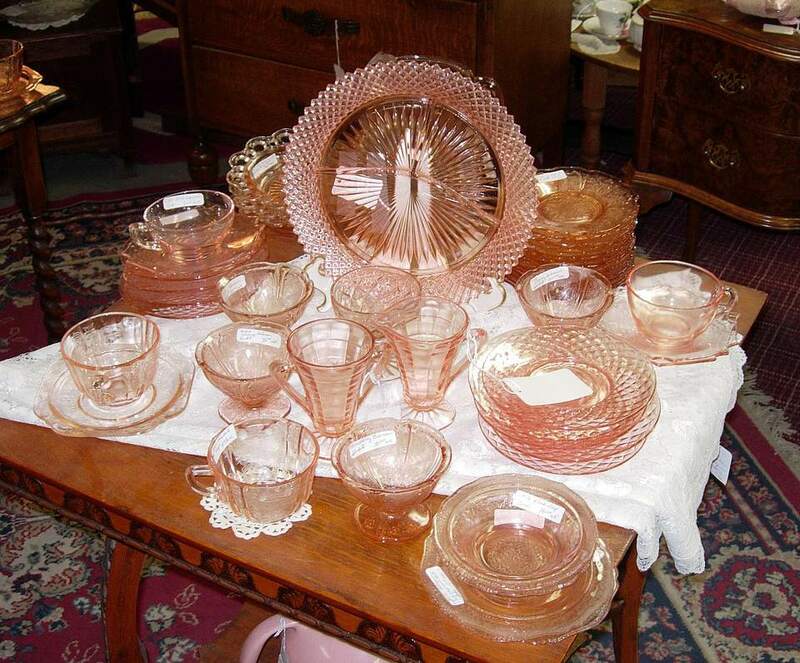 Doing a keyword search on “pink Depression glass” will bring up hundreds of items to browse, many of them offering bargain potential. Washburn also suggests visiting glass shows for competitive pricing and a superb selection. “When you have 50 dealers selling glass in one location, that can mean better prices since they’re all competing for the dollar that walks through the door,” added Washburn. He also suggests being a diligent shopper to find the best deals, and don't forget to haggle for a better price when appropriate. “It’s nice to have a pretty china cabinet filled with glass, but it’s even nicer to share the love of glass with friends and family on special occasions,” Washburn said. Going beyond traditional place settings by using pink tumblers, cup and saucer sets or serving pieces with contemporary China can be a beautiful way to break the monotony of a matched set. But going beyond the dinner table to decorate can be an exciting and interesting way to utilize a Depression glass collection. Some glass lovers show off their rare pieces, such as impressive vases or lidded candy dishes, as “trophies” on mantles or entrance tables. Don’t be afraid to use your vases to hold fresh flowers, but be sure to change the water daily and never let the water evaporate in the vase or damaging mineral deposits may accumulate. Pink Depression glass can be surprisingly versatile in bedrooms as well. Placing a small pitcher and tumbler on a bedside table for use as a water set adds an air of charm to a guestroom. A console bowl filled with silk flowers looks lovely on a dresser. Or, as Washburn suggests, try “wallpapering” with plates of different shapes, patterns, and sizes in any room of the house for a beautiful display. Do You Know Westmoreland's Paneled Grape Milk Glass?